It’s always a bit difficult finding toys this time of year. The stores full of parents and grandparents to contend, you have to deal with random shipment schedules, and, of course, untrained stockers. So, I felt extra lucky when I came across Star Wars Vintage Collection Wave 3 at my Target last week. I’m a casual Star Wars fan. I enjoy the franchise, but I’m not obsessed with it like some of my other collections. Mostly I just stick with the characters I love and easily ignore the rest. But that’s getting harder with every release of Vintage Collection figures. With incredibly detailed sculpts, fantastic paint jobs and wide range of articulation, I find myself wanting to buy figures I don’t care about just because they look so good. (Damn you Wooof!) Even the packaging pushes my “Buy it Now” button. The one character I knew I was getting from wave three was Admiral Ackbar. 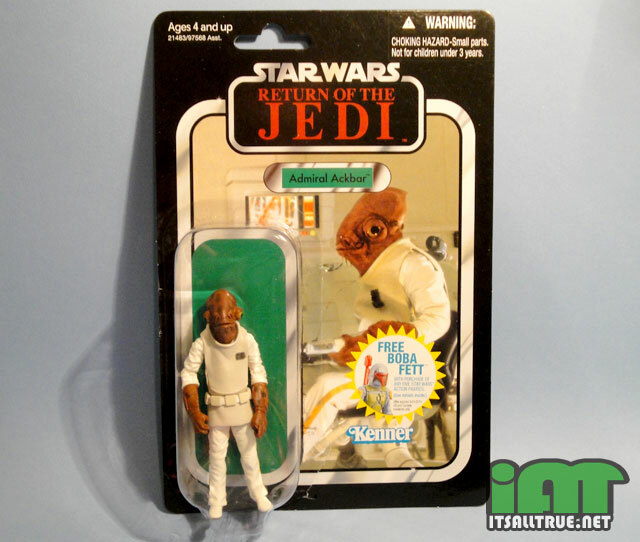 The good Admiral is one of the first figures I remember owning as a kid. I didn’t really even know who he was back then, I just liked how he looked with his smart uniform, short feet, and alien head and arms. In the real movie Luke may have defeated Vader, but in the battleground of my room, it was always Ackbar to lead the charge and vanquish the Empire. I still have that old figure, and even though the many years of love have taken their toll, he’s still cherished in my collection for all the fond memories. I’ve said it before, but I’ll say it again. I love the retro packaging they use for the Vintage Collection figures. Although other lines like MOTU Classics and GI Joe try to evoke similar feelings, their packaging is still just an update of the original. With Star Wars, it is the original. Such a simple idea, yet so effective in making me nostalgic. 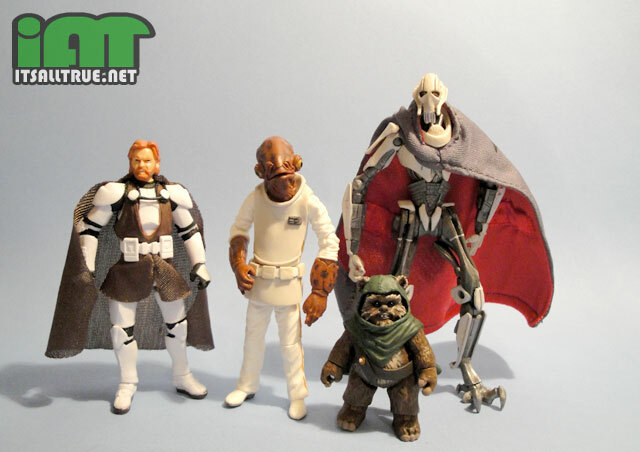 Ackbar’s sculpt is incredibly detailed for such a small figure, which seems to be the par for this line. There are wrinkles and flaps of skin all around his eyes and neck. Those little tendrils are sculpted around his mouth and nose. There are even those little squid-like tube things coming out from behind his eyes. 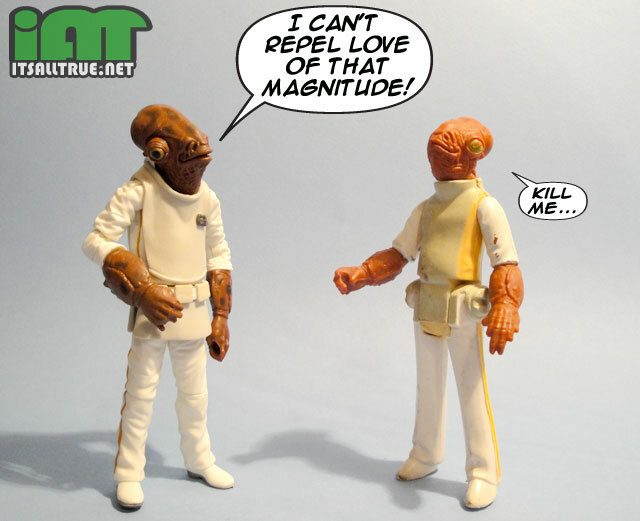 And unlike the Power of the Force figure, this Ackbar’s head doesn’t seem squished and wide. His arms are equally detailed and look like a crab’s shell with long webbed fingers. I was impressed to see his arms were sculpted in a similar pose as the 1983 figure. Ackbar’s uniform is more accurate this time around with its slightly hunched back and smooth tunic. The arms and legs are sculpted with wrinkles and make the joints look very natural bent or straight. One thing I do miss from the old figure is the style of his feet. This Ackbar’s feet are more human, and probably more accurate, but I really loved those short space shoes the original figure wore. Adding to the wonderful sculpt is the simple yet effective paint job. 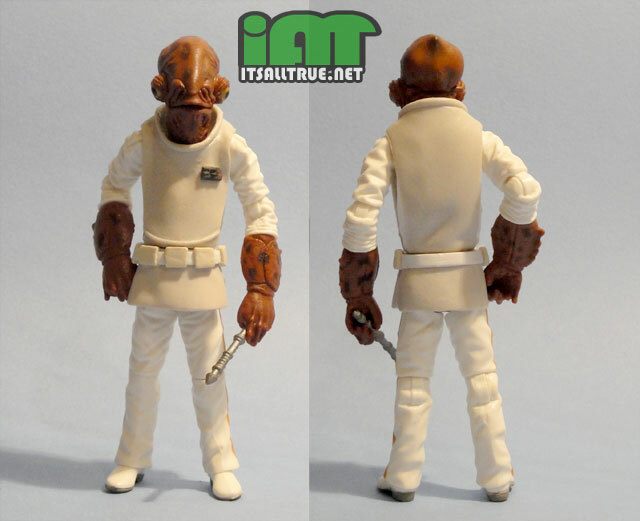 Ackbar’s head and arms are molded in that dark brown color with a pattern of dark splotches added for detail. Offsetting the darkness of his skin tone are his glossy and golden colored irises. His uniform is a simple muted gray and white with that smart looking yellow stripe running down the sides (love that). Hasbro even colored the soles of his shoes dark gray and the tiny pips on his rank insignia individually. It’s great to see such small details with no slop. Continue to Page Two…. My Wal-Mart had them and all the Star Wars figures were on sale for $6 so I snagged him (Ackbar) and almost all the bounty hunters. They were only missing IG-88 and Zuckuss. I don’t normally buy Star Wars figures, but like you, the vintage line has really had me hooked. That’s good, I’m glad more places than just Target are putting them out. This line has got the right amount of everything to make it near perfect and super hard to resist, lol. I believe the wand thing he has is a remote control used to page through the different holograms he shows the Rebels while explaining their battle strategy. So basically a futuristic Power Point. Ah, ok. Thanks Rage, I’ll have to go back and see if I can find it in the movie.